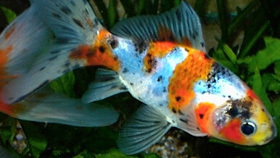 A Shubunkin is an attractive breeding variant of the common goldfish. 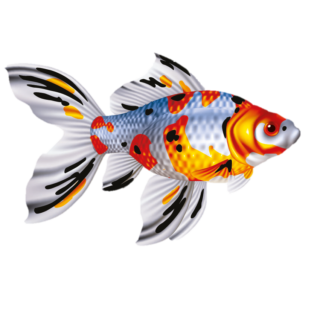 What is so beautiful about a Shubunkin are its spotted colours of red, yellow, orange, blue, white and black in combination with metallic and transparent scales. This makes a Shubunkin have some kind of a mother-of-pearl appearance. It has a simple tail and long spotted fins. The form of the body is that of a common goldfish. It is a strong fish which will not easily fall ill. Nevertheless it is sensitive to carp louse and mould, like many cypriniformes. Your pond should be at least 28 inch deep to let Shubunkin hibernate and besides there should be shallow areas of about 6 inch for propagation purposes. The pond bottom should have a coarse composition, because this fish is grubbing rather much in the bottom. Shubunkin like water plants in a pond, however, they also need room to swim. This fish should be kept in a school of at least 5 specimens. It can easily live together with koi, golden orfes and goldfish. A Shubunkin likes balanced feed that is easily digestible.